1. against the wind; 2. against the wall; 3. against the sky.” In the late 50s, Ono was part of a constellation of creative people connected to composer John Cage, and began experimenting with what she called “instruction works,” meaning “paintings to be constructed in your head.” Her Voice Piece for Soprano was one of these works, and was published a few years later in 1964 as part of her book Grapefruit. She speaks of this work as giving her an opportunity to express her rebelliousness as a woman and the need to scream against certain situations in life. She also saw it as an act of resistance, stating in a 2015 interview connected to a performance of her Voice Piece, that if women don’t express their emotions, they can become ill. This coming February 23, in a co-presentation between the Music Gallery and the Gardiner Museum, Ono’s Voice Piece for Soprano will be explored by three local artists who have been invited to respond to Ono’s instructions for screaming. These performers include Lillian Allen, a pioneering voice of dub poetry in Canada; the Element Choir, an improvising choir directed by Christine Duncan; and Mamalia, the former lead singer of the JUNO-nominated contemporary jazz troupe Sekoya. The concert, titled “Voice Pieces,” is being held as a companion event for the Gardiner Museum’s exhibition Yoko Ono: THE RIVERBED, running from February 23 to June 3. Ono’s resistance piece remains as timely now as when first created, since the need for women to speak out with force against how they have been treated within patriarchal institutions has reached a tipping point. However, I’m certain that Ms. Ono would not concur with the descriptive phrase used in the Music Gallery’s press release, describing this voice as the “out of control female voice pushed to its supposed limits,” nor with using the word “hysterical” to describe the type of voice that engages in therapeutic screaming. It’s time to reframe how we think of the female voice, long held in contempt, mistrust and suspicion from the days of early Christianity up to the present. I approached Allen to speak about her work as a leader in spoken word and dub poetry, her understanding of the voice, and of her plans for the Voice Pieces concert at the Gardiner Museum. Back in 1988, I had interviewed Allen for Musicworks magazine, and so I began with asking her how she would describe the evolution of her career over these past 30 years. She described her work as “helping to innovate, motivate and originate the form of spoken word which has become so important in the worlds of hip-hop and rap. We then turned to speaking about the voice and I asked her to comment on the voice itself and her relationship to her own voice. “Voice is the thing that gives you motion, gives you vibrational motion. It is vocalized emotion that makes you larger than whatever moment you are in, both in sound and in what you have to say. There is a time to be still, and the inner voice is there. But the voice itself is so full of life, it’s almost a symbol for life and growth. It is that channel inside the unknown, it gets into things we don’t know we know, or that we know but forget. It’s like a path in a forest that you either cut or make. In your psyche, the voice makes that path for you, and you can journey with it, see things and go into imaginary places. It’s the power of YOU, its part of your heartbeat, it’s the power of your lungs, your muscles, it’s not just your fingers on a keyboard. You connect with it, it’s floating in and out of you. Other upcoming events include the Toronto Symphony’s New Creations Festival, running this year from March 3 to 10. In a departure from previous years, there will be no featured guest composer or curator. Instead the programming will feature three concerts of TSO music director Peter Oundjian’s personal favourites as a way of celebrating his 14th and final season as music director, which has included the successful New Creations Festival. We will hear works by Vivian Fung, Larry Alan Smith, Daníel Bjarnason (March 3); Wolfgang Rihm, James MacMillan and the festival composer competition winner (March 7); and Esa-Pekka Salonen, Gary Kulesha and John Adams (March 10). Last year’s festival curated by indie musician Owen Pallett highlighted a diverse array of composers and performers, attempting to address issues of race and gender inclusion. Alas, I note that it appears this initiative was not continued in this year’s offerings. Each year at the University of Toronto’s New Music Festival, a composer is invited to be the Roger D. Moore Distinguished Visitor in Composition. This year the festival, which runs from January 21 to 28, will host Canadian composer, sound artist and keyboardist Nicole Lizée. I’ve been fascinated by Lizée’s unique approach to working with technology and instruments, so this felt like a perfect opportunity to learn more. One of the key features of her work is the use of what she calls “glitch.” In our recent interview she offered an inspiring description of her unique relationship to working with media-based technologies and what it is that fascinates her about malfunctioning machines. Lizée’s passion for both music and film led to a desire to merge these worlds. This, in combination with her strong emotional connection to the malfunctioning analogue technologies of her childhood, inspired her vision to bring this world into the concert hall and to mix it with live instrumental performers. Many of her works also use video, but not as accompaniment to the music – rather, the video becomes an instrument itself that the performer engages with in a synced-up dialogue. Even the glitches themselves become instruments. What enables Lizée to use these glitch features in the composing process is the notation system she has devised. And she doesn’t just approximate the sound, but rather employs great precision to accurately translate what is occurring within the glitch. Using changing time signatures for example, rather than adjusting everything to regular 4/4 time, is one outcome of her approach. Spending years developing her transcription process was essential to developing her perspective on composing music. And finally, her work Isabella Blow at Somerset House will be performed on January 24 by the Cecilia String Quartet, who played the work earlier this year at the 21C Festival in May. Lizée wrote the piece as an acoustic representation of fashion designer Isabella Blow and what her impact on the fashion industry might sound like. If you are intrigued to experience more of Lizée’s fascinating work, I encourage you to attend not only the concerts, but also her composition masterclasses on January 24 and 26, and the composers’ forum on January 23. The festival will also feature concerts from the Faculty of Music’s opera, chamber music and orchestra series, a night of improvising music from the jazz department and a concert devoted to electroacoustic music. In addition to Lizée’s Isabella Blow, the Karen Kieser Prize Concert on January 24 features Tyler Versluis’ 2017 prizewinning work 3 Unuttered Miracles for accordion and percussion, along with past prize winner Riho Maimets’ Three Movements for Marimba. On January 26 in the Array Space on Walnut Ave., The Array Ensemble performs four new works by four Canadian composers: Rebecca Bruton (Calgary), Marielle Groven (Montréal), Stephen Parkinson (Toronto) and Holger Schoorl (Toronto). Bruton’s work happens in the intervening spaces between avant-pop, experimental chamber music and noise, and one of her current projects is co-creative producer of Tidal ~ Signal, a Vancouver-based festival dedicated to increasing representation of women and transgender artists within the fields of sound art and experimental music. Groven’s work draws on raw and emotionally charged sounds, with attention to connections between evocative human and instrumental sounds. Parkinson is a composer and performer with the Drystone Orchestra. His work, Desires Are Already Memories, is part of Arraymusic’s New World CD. Schoorl is a guitarist who is an active participant in Toronto’s improvisation community. The day following the concert, all four composers will re-gather and spontaneously compose together in various combinations. Many of early December’s events of new music were mentioned in my November column, including the “Urgent Voices” concert presented by Continuum Contemporary Music on December 8 and 9 at the Daniels Spectrum Aki Studio, ...as well as New Music Concerts’ “Concertos” on December 3 at the National Ballet School’s Betty Oliphant Theatre. Upcoming New Music Concerts productions in the new year include “Kammerkonzert” on January 14 at the same venue, with a focus on music by the primary composers of the Second Viennese School, Arnold Schoenberg and Alban Berg. Michael Oesterle’s Chamber Concerto will also receive its world premiere there. Then on February 4, NMC presents Calgary’s Land’s End Ensemble at Gallery 345 on Sorauren Ave., performing compositions by Canadians Hope Lee, Sean Clarke and Matthew Ricketts. Anton Webern’s 1922 chamber arrangement of Schoenberg’s Kammersymphonie Op.9 will round out the program. And finally, the Music Gallery presents their first Emergents Concert of the season on December 7 at the the 918 Bathurst Centre for Culture, Arts, Media and Education, with four contemporary song cycles created as part of the Sounds Of Silence Initiative. After just one year, this initiative has brought together over 50 composers, poets and musicians to create new Canadian art song that tells the story of a diverse Canadian cultural identity, and supports, in particular, artists from Indigenous, immigrant, black, refugee and LGBT communities. For details on all these and other performances of interest, consult our comprehensive concert listings in this December-January double issue of the magazine, or online at thewholenote.com/just_ask, where you can filter the listings by genre to simplify your search. Often in this column I write about what’s happening in the world of new contemporary music from the composer and presenter perspective – their ideas, visions and inspirations. However, this month I want to focus on those who undertake to bring these ideas to life – the performers. New Music Concerts’ event “Concertos” on December 3 provides the perfect context for this conversation as it will feature three works designed to highlight the role of the solo performer. The concert will present concertos written for soloist and chamber ensemble by composers Robin de Raaff (Netherlands), Linda C. Smith (USA/Canada) and Paul Frehner (Canada), featuring percussionist Ryan Scott, pianist Eve Egoyan and clarinettist Max Christie, respectively. Frehner’s piece, Cloak, is a newly-commissioned work for clarinet and chamber ensemble, so I contacted Christie to find out more about the work from his perspective and also about his extensive career performing contemporary music for a number of the new music presenters in the city. The “Concertos” concert includes a performance by Eve Egoyan of Path of Uneven Stones by Linda C. Smith. Egoyan has had a busy summer schedule and has just returned from a European solo recital tour. A recent residency in Quebec City gave her the opportunity to be involved in the creation of an intuitive interface for the piano that “explores the frontiers between notes played, those heard and those transformed until they meet the imaginary.” Elliott Carter’s 2011 String Trio is also part of the program, along with Ryan Scott performing the Canadian premiere of Robin de Raaff’s Percussion Concerto. Beyond his role as an outstanding percussionist, Scott is also the artistic director of Continuum Contemporary Music, which will be launching its new season with “Urgent Voices” on December 8 and 9. This event is Continuum’s contribution to the commemoration of Canada 150, and they are doing so with a series of compositions by Anna Höstman, James Rolfe, Ann Southam and Scott Wilson that combine stories, reflections and dreams using song, spoken word and multimedia. They are also weaving in the honouring of Glenn Gould’s 85th birthday. While film is shown of Gould performing music from Bach’s Well-Tempered Clavier, Book 2, Steinway’s latest player piano innovation called the Spirio will interpret Gould’s finger depressions and releases to recreate a live rendition of the original performance. Esprit Orchestra’s November 19 concert offers an opportunity to hear Concerto for Violin and Orchestra by French composer Marc-André Dalbavie, with a performance by Véronique Mathieu. Mathieu is another performer who has made the performance of contemporary music a priority, particularly music by Canadian and American composers. The program also features works by Icelandic composer Daníel Bjarnason, as well as by Canadians Douglas Schmidt and Ana Sokolović. The Thin Edge New Music Collective presents “Sensing” with three shows at the Canadian Music Centre on November 11, featuring music by composers Höstman, Scime and Morton Feldman. Arraymusic has two events coming up – the first on November 22 is a celebration of the music of Wilhelm Killmayer, an underappreciated German composer whose surreal music is ardently supported by Array’s artistic director Martin Arnold. Then on December 2, American Sarah Hennies will perform her piece Gather & Release for vibraphone, sine waves, field recordings and bilateral stimulation. Her music is an immersive psycho-acoustic experience often realized by an endurance-based performance practice. And finally, as we prepare to enter that ambiguous state of “holiday time,” Soundstreams presents a more edgy twist to the usual stream of music one hears. Their Electric Messiah returns for the third year December 4 to 6, with a special performance on November 24 by their resident artist, sci-fi turntablist SlowPitchSound. This will be part of a behind-the-scenes look by SlowPitchSound and other Messiah performers at what goes into the making of this fast-growing holiday favourite. Welcome back to another season of auditory excavation and resistance. For isn’t that what diving deep and creating new expressions using sound is all about? During the upcoming X Avant Festival produced by the Music Gallery – which takes resistance as its theme – this is definitely what will be occurring. Using this theme as a lens for this month’s column, I will be taking an overall survey of what you can expect both in the upcoming season and also during the month of September. The big news at this hotbed place of sonic experimentation this fall is their change of venue. Due to renovations both at their usual home at St. George the Martyr church and in the neighbouring church lot, the Music Gallery’s programming will be happening at a variety of different venues for the foreseeable future. In my conversation with artistic director David Dacks about what sort of impact this change in venue will have, he noted that the Gallery’s Departure Series has already been creating programming in different venues for the last few years. The goal of this series is to make sure that the MG isn’t just identified with one place and to highlight their role as a presenter. For the fall of 2017, the Gallery’s programming will be happening at 918 Bathurst, a not-for-profit arts and culture centre located in the heart of Toronto’s Annex neighbourhood. Dacks mentioned that this location is actually closer to where many of the gallery’s patrons live, and this new location will provide opportunities for audience outreach in a more residential area of the city. And so it is fitting that the first show of the season on October 11 at 918 Bathurst will be a concert in the Departures Series with a performance by Man Forever aka Kid Millions touring a new album, Play What They Want. Joining the bill on that night will be Toronto-based percussionist, performer and composer Germaine Liu and her ensemble, along with Luyos MC/Reila. Expect an evening of indie rock, water-based music, electronic soundscapes, traditional chant and frequency art. While changing location could pose a potential hazard for audience attendance, Dacks isn’t too worried. Last year was the MG’s biggest year to date where attendance was up by 40 percent, with seven sold-out concerts within the year. Each of those seven events was a partnership, thereby boosting audience numbers and reaching out to new communities. As I mentioned above, “Resistance” is the theme of this year’s X Avant Festival running from October 11 to 15. “It’s the thing to do right now, for obvious reasons, and more artists are exploring ideas that fit into this theme,” Dacks said. One of the festival concerts will feature the music of composer James Tenney, who lived and taught in Toronto from 1976 to 2000 and had an important influence on many local composers during his time here. The program will include Pika-Don, which Tenney composed in 1991, a piece that features the voices of many local artists, including my own, which was a surprise to me when Dacks mentioned it. Rusty memory! Preceding the concert will be a panel discussion on questions such as what it means to be a socially conscious composer now as opposed to 20 to 30 years ago, and what audiences expect from socially conscious music in the concert hall. The festival is also hosting another Deep Listening workshop led by Anne Bourne, taking place at the Tranzac Main Hall. In last year’s festival, Deep Listening pioneer Pauline Oliveros was a featured guest, and her sold-out concert was the last time she appeared in Toronto shortly before her passing in November. And of course the Music Gallery will continue its tradition of co-presenting with various partners. One such concert to note coming up on October 22 is the New Music Concerts’ season opener. It will be an opportunity to hear Tel Aviv’s Meitar Ensemble, whose membership comprises quite an array of virtuoso performers specializing in contemporary music. Toronto is becoming known as a major centre for contemporary indie opera. In the recent summer issue, I wrote about one such opera, Sweat, performed by the Bicycle Opera Project. I had an opportunity to experience the performance of this work of “resistance” this past summer and one of the highlights for me was the ensemble singing, which composer Juliet Palmer spoke about in our interview. The stage dynamics between the a cappella singers intermixed with their interlocking rhythms made for a stunning and compelling performance. The mere fact of giving such a prominent role to an ensemble of singers breaks operatic traditions while laying new ground for a different approach to this older art form. Sweat was originally workshopped by Tapestry Opera, a major player in the current indie-opera scene, who are starting their season early this year with a performance of Bandits in the Valley. This opera is set in 1860s Toronto, and will be performed at Todmorden Mills, located, appropriately enough, in the Don River Valley. The story brings together a local bandit group with a troupe of travelling Gilbert and Sullivan singers who conspire to steal a mysterious object from a wealthy home situated in the valley. This story is reviving part of Toronto’s history by highlighting the fact that the valley was a haven for smugglers and bandits during the late 1800s. The work was composed by Benton Roark with libretto by Julie Tepperman, and features six performers moving throughout the various locations at the Todmorden site while singing and playing a variety of instruments. It will be an intimate setting with limited space, so audiences must reserve tickets. The good news is that the performances are free and run throughout the month of September. Gallery 345, located at 345 Sorauren Avenue, is another hotspot of performances spanning many genres. This month sees them partnering with Arraymusic on September 19 to present Montreal’s Quatuor Bozzini performing Cassandra Miller’s Jules Léger Prize-winning piece About Bach. Miller began this work as a solo piece for viola specifically for violist Pemi Paull. She focused in on Paull’s musicality, first creating a transcription of his performance of Bach’s Partita No. 2. She then added her own harmonies to create something akin to a chorale, while setting up a process that takes the musical materials through a meandering journey. This version for string quartet is the result of many years of working with Quatuor Bozzini. The evening will also include a performance of Bryn Harrison’s new Piano Quintet by English piano virtuoso and experimental music champion Philip Thomas. Later in September, the TSO will be performing two newly commissioned works by Canadian composers. First of all, on September 22 and 23, their “Tribute to Glenn Gould” concert will include the world premiere of Kelly-Marie Murphy’s Curiosity, Genius, and the Search for Petula Clark, a work that the composer wrote based on the impact that Gould had on her creative life. The evening will begin with a performance of Wīhtikōw, composed by Yannick Plamondon, another in the series of "Sesquies" that have been occurring all year. A few days later, Alexina Louie’s Triple Concerto will have its world premiere. 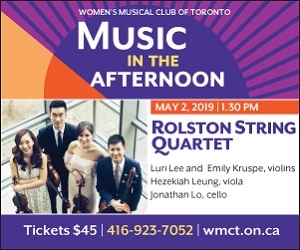 This piece was co-commissioned by the TSO, the Montreal Symphony and the National Arts Centre Orchestra, and will feature the concertmasters of all three orchestras. The Sesquie for that evening is Hyacinth, by composer Rolf Boon. I will be writing more about Murphy and Louie in upcoming issues this season, so stay tuned to hear more about these pieces as well as what is currently, and coming up, on the composing plates of these two dynamic and innovative creators.